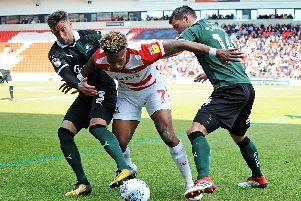 Laid back loan striker Mallik Wilks has admitted that being dropped was the proverbial kick up the backside that he needed. The 19-year-old made a scoring return to the starting line-up in the 3-3 draw with Gillingham after being left out at Rochdale. “I was buzzing to get on the scoresheet because I got left out of the team last week so I had to prove a point,” said the Leeds United frontman. “I had to work hard in training and play well when I came on at Rochdale, and that’s what I did. “It taught me that I cannot get too comfortable. There’s always someone fighting for your spot, which is a good thing for this team. “My performances had dropped. I was careless on the ball,” he added. Despite twice coming from behind, Wilks revealed the mood in the dressing room was one of annoyance after Saturday’s draw. “It was disappointing to go 2-0 down and I thought it was going to be a repeat of Fleetwood but the good thing was that none of us panicked,” he said. “We played good football and we should’ve got all three points.